In a previous blogpost I showed you how to create new domains in Office 365 using the Microsoft Online Portal. You can do the same using PowerShell which can be much more interesting, especially for partner reselling Office 365 through the Cloud Solution Provider (CSP) program. If you want to know more about PowerShell, check my previous blog post Manage Office 365 with PowerShell. 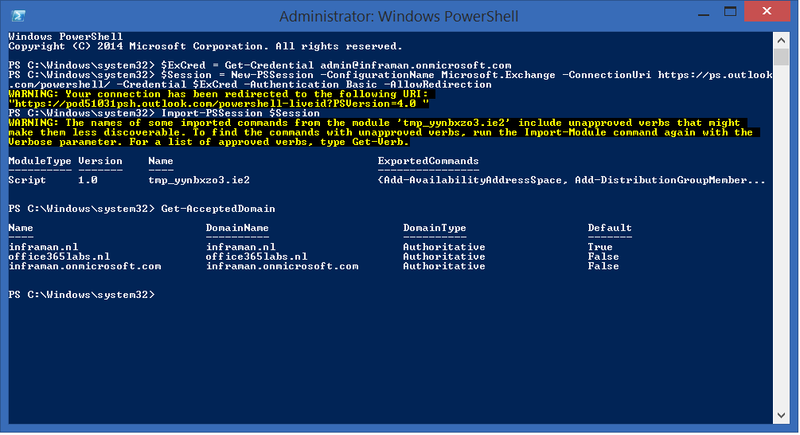 When the domain is entered into Office 365 it needs to be validated with the Get-MsolDomainVerificationDns command. This will return the DNS record you have to enter in public DNS for verification purposes. I prefer to use a TXT record (DnsTxtRecord) but an MX (DnsMXRecord) can be used as well. After adding the record to public DNS the new domain can be verified using the Confirm-MsolDomain command. Please take DNS replication time into account! The domain is now added to Office 365 and (almost) ready for use. The next step in the Microsoft Online Portal is to configure uses and the domain purpose, i.e. used with Exchange Online and Lync Online. Based on your selection the DNS records are shown which you have to configure. When you check the Microsoft Online Portal at this point you’ll see that the new domain is validated, but needs some additional configuration. The status is Setup in progress (domain verified) as shown in the following figure. Unfortunately it is not possible using PowerShell to configure the domain purpose so you have to use the Microsoft Online Portal (impossible to do if you have hundreds of domain, or when you’re a hosting company) or leave it this way. The differences are clearly visible. The office365labs.nl domain is created using PowerShell, the inframan.nl domain was created using the Microsoft Online Portal (in a previous blog post, but without selecting Lync). On the other hand, when you leave it this way the entire configure will work as expected, as long as you configure your public DNS with the correct entries. The DNS records that need to be created are standard entries, with an exception of the MX record of the new domain. The domain name is part of the MX records, but the “.” in the domain name is replaced by a “-“, followed by mail.protection.outlook.com. In an upcoming blogpost I’ll discuss managing Exchange Online using PowerShell in more detail. You can use PowerShell with the Microsoft Online module to create additional domains in your Office 365 environment. Creating the new domains is easy and a matter of a few commands. The domain purpose is not configurable via PowerShell so you have to do this using the Microsoft Online Portal or omit this step. I’ll continue to monitor developments here (I’m not that confident since this situation exists for a long time now, unfortunately) and when things improve I’ll update my blog post. Walk through the steps that are presented. When done, you will get a popup in the right top corner to complete your setup. If you click and that you can continue the wizard. It is required to press “finish” in the last step. Now the warning should be gone. Hello. Thanks for the post , interesting stuff. Any idea if its possible to create a CNAME record for an existing TLD hosted/working on O365 ? I have a task to use ARM Template to create a App Service Plan as part of a VSTS Release Pipeline. I would like to deploy a custom domain and binding at the same time. I cannot do this unless its possible to create a CNAME record via powershell during the release pipleline. Thank you. Scott_Lotus. Per your documentation, after creating a new AAD, Exchange automatically creates a new Authoritatvie Acceptance Domain. If/When you run the Remove-MSOLDomain, does this also remove the Exchange Acceptance Domain or does this need to be removed in the EAC?